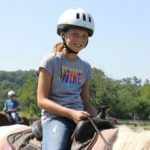 *Sessions 1, 2, 3, 4, 5, & 6 Horse Camps are full, to be placed on a waiting list please contact our registrar at 618-695-2489 ext. 109. Love horses? Love Camp O? Want both? Horse Camp is for you. Spend your days at the Ondessonk Stables learning how to care for and groom your horse, develop basic horsemanship and riding skills, and enjoy long rides through our pristine pasture lands and oak-hickory forested trails. Spend your evenings doing those Camp O activities you love, the nights cozy in your cabin. And yes, you can bring your horse on the overnight! Visit the Packing List Page to know what to pack. Read the Horse Camp Itinerary to see what you’ll be doing.